For all you cat lovers out there, me included. Thought you might get a kick out of this picture. 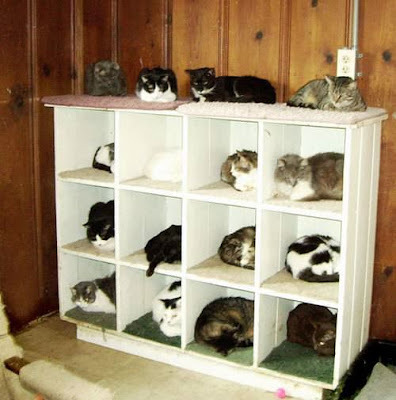 I have a friend who has 9 cats, she could use the bookcase. What a great idea! I thought it was a great idea! Have to wonder how they managed to get them all in there at the same time. Cats tend to have a mind of their own. Wow! Can't imagine trying to kepp all those mouths fed, but that sure is a great idea for giving them each their own little space.